This week Brodie and I were talking about random stuff after recording a podcast, and we realized something crazy: David Ferrer was about to embark on his seventh straight week of playing professional tennis. Later, someone on Twitter pointed out that Richard Gasquet was on a similarly excessive stretch. However, as Carole Bouchard noted, you can understand why Gasquet was doing it: Richie was trying to qualify for the World Tour Finals (for just the second time in his career), and his spot was far from secure. David Ferrer, on the other hand, had already qualified for his fourth straight (and fifth overall) trip to said World Tour Finals. So why on Earth would he sign up to play for 7 straight weeks? ** If an event appears in italics, it means Ferrer made the final. If an event appears bolded, it means Ferrer won the title. – Note how there used to be two weeks of 250 events after Shanghai, and there was a free week between Paris and the World Tour Finals. – At the start of the 2010 post-US Open stretch, David Ferrer was ranked 11th in the world. He finished the season at No. 7. – In 2011, Ferrú took part in 2 Davis Cup ties: the semis against France and the final against Argentina. He played (and won) one live rubber in each one. – At the start of the 2011 post-US Open stretch, Ferrer was the World No. 5. He finished the season in that same position. 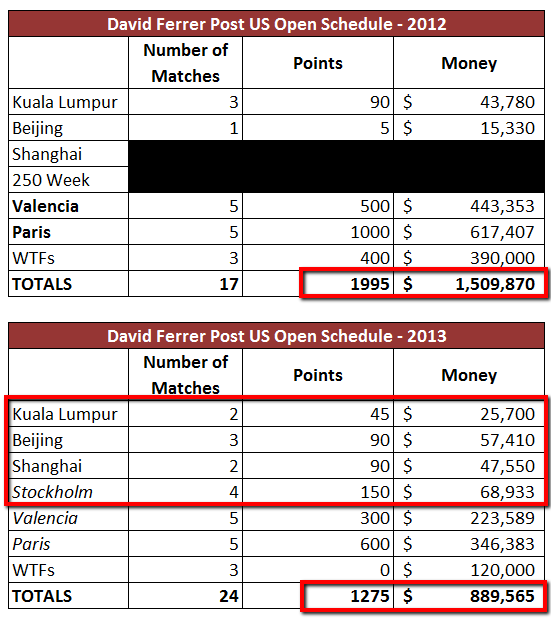 Notice how in 2011 Ferrer made less money, but earned significantly more ranking points. The main culprit for this discrepancy was David’s desultory performance at the 2010 World Tour Finals, where he failed to even win a single set in any of his 3 matches. The nice thing about the 2011 schedule is that it truly looks like the kind of schedule an elite player (read, someone like Ferrer, who is ranked in the top 5) should sign up for: no 250s, and never more than two straight weeks of play. About the ATP calendar for these two seasons: only one week of 250 events in Europe after Shanghai are allotted, and the free week between Paris and London has disappeared. – In 2012, Ferrer retired during his first round match in Beijing, and then withdrew from Shanghai due to a stomach virus. I have no clue if Ferrer intended to play a 250 in Europe after that or not, but the virus did afford him a nice period of rest of almost 3 weeks. And he returned to play and ended up having one of his most successful patches of play in his career (winning his first ever M1000 title, and finishing the year on a 14-1 tear). – Ferrer was dominant in Davis Cup in 2012, and played both live rubbers in the semifinal tie against the United States as well as the final against the Czech Republic. He won all four matches (but sadly, not the cup). – Ferrer didn’t play any Davis Cup matches after the US Open in 2013. Notice how nicely the two weeks off before Valencia, Paris and the World Tour Finals worked in 2012? In that three week stretch, Ferrer collected almost as many points as you would get from winning a Grand Slam (1900 as opposed to 2000), as well as almost $1.4 million dollars. Also, that three-tournament stretch is almost mandatory for Ferrer, since he’s part-owner of the Valencia ATP 500, which happens to be the closest tournament to his hometown of Xabia. Hence, taking a 2 week break before that trio of tournaments seems like a good policy, even if it was influenced that year by the stomach virus. ** Ferrer needed to play one 500 after the US Open, and Valencia fulfills that requirement. ATP 250s aren’t mandatory, and Ferrer qualifies for an exemption for at least 1 Masters 1000, given he’s played over 600 matches. David could’ve dropped Shanghai, given that he had played all mandatory Masters 1000 up to that point (Ferrer didn’t play Montecarlo, but that’s not a mandatory M1000). Playing the Asian swing wasn’t a particularly great decision in retrospect: Ferrer didn’t win more than 2 matches in any of those 3 events. All those frequent flier miles netted him a total of 225 points, and $130,660 (plus appearances fees – more on that later). – Ferrer had played only 5 events in the two seasons before this one (though he was in a Davis Cup tie at the start of the post-US Open stretch, and another after the World Tour Finals in both years). However, not having to play Davis Cup in 2013 apparently made Ferrer think that adding two ATP 250s was a good idea. – Notice that in 2012, which is by far Ferrer’s most successful run during this part of the season, the Xabia man played the fewest amount of matches (17), yet amassed the highest number of points and the largest amount of cash. 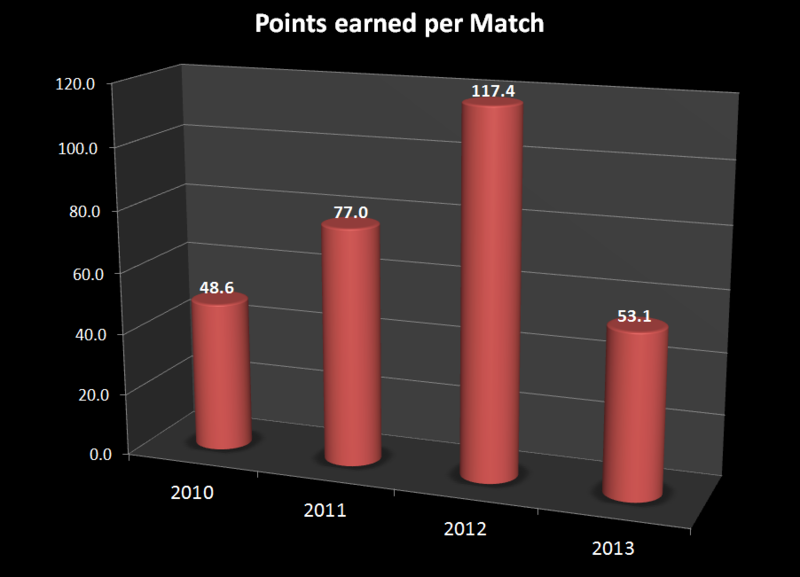 Notice the positive trend in points won per match played. It all went to hell this year. 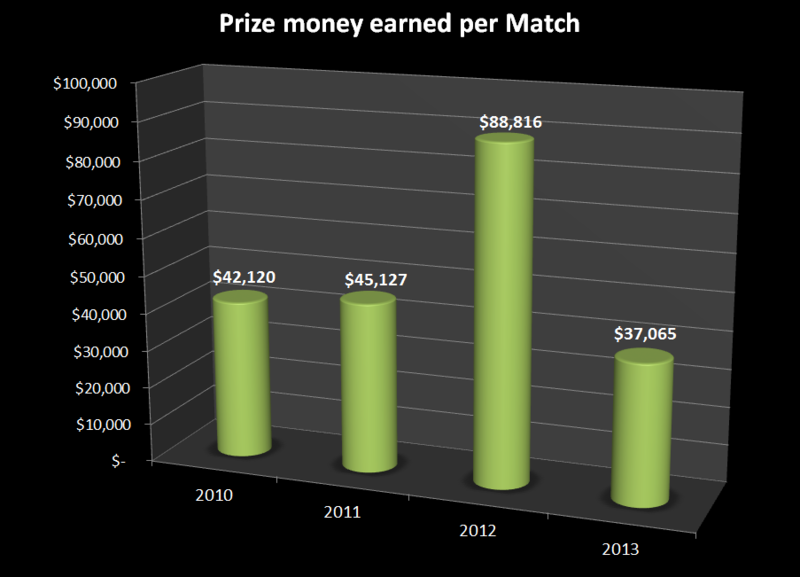 In terms of money earned per match, Ferrer dropped below the levels of 2010, when he was ranked in the periphery of the top 10. However, this is a good time to talk about appearance fees. Masters 1000 events don’t give appearance fees, since they are mandatory for the top players. But the 500s and the 250s have long taken part in securing the participation of top players via contract. These figures aren’t disclosed publicly, but what is clear is that the higher your ranking (or your profile), the higher the interest (read: appearance fee) that type of event has to display your talents. The point is, we will never know how much money Ferrer got from Kuala Lumpur, Beijing and Stockholm (I’m assuming Ferrer didn’t give himself an appearance fee to show up to his own event in Valencia – that would be weird). I just hope it was worth at least $620,305, which is the difference between money earned in 2012 and 2013. 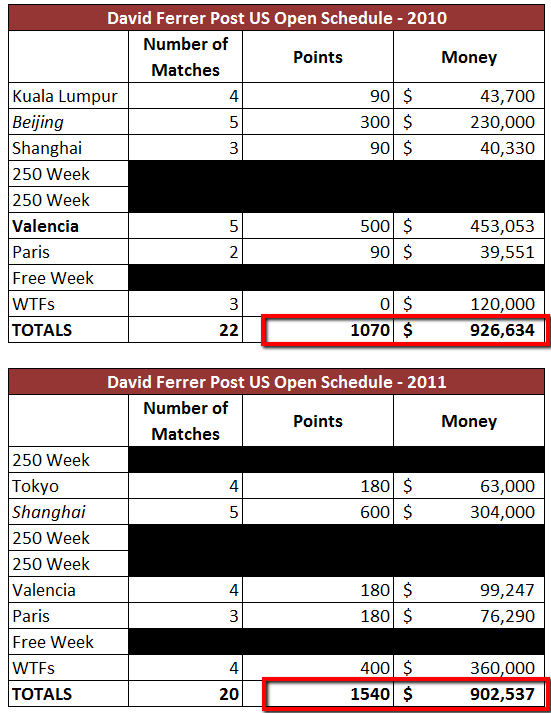 However, appearance fees don’t earn you any points, and Ferrer is 720 points short of matching last year’s number. What is unfortunate is that by playing this ridiculous schedule, Ferrer robbed himself of a chance to earn a large amount of points and a significant amount of cash in London, where any round robin stage is worth 200 points and $120,000. David had winnable matches against Tomas Berdych and Stan Wawrinka (combined H2H was 14-7 in Ferrer’s favor, before losing to both this week), but he won’t collect any prize money or points from his 3 matches in London (aside from the nice $120,000 you get just for qualifying). I just don’t get how an experienced veteran, one who has been within the ATP top 5 in the past 3 seasons, one who is at the end of his career, one who is 31 years old, schedules his tournaments in such a silly way. It’s particularly sad when you consider how in each of the past three seasons, Ferrer had become quite efficient about his post-US Open schedule. This is an odd thought, I realize, but I wondered if his intense schedule this fall was a reaction to his results during the summer where he didn’t collect many points; in other words, he felt compelled to over schedule these past two months to maintain his ranking realizing he may not be able to replicate his success in Paris last year. Most of us were surprised he made it to the final in Paris, but in the case that hadn’t happened, the loss of points from last year wouldn’t be so severe. That reads like a word jumble, but I think you’ll understand what I’m saying. I thought the requirement to skip a master event is 600 wins, not 600 matches played? Among all active players, Federer and Nadal are the only two who made it, no? Nope – the requirement is 600 matches (it doesn’t specify whether they have to be wins). Check the ATP Rulebook here: http://www.atpworldtour.com/Corporate/Rulebook.aspx. It’s on page 12 of the manual, page 7 of the PDF.